There are many Crossfit gym bags available on the market right now and choosing the right one could be a little confusing. One bag could have the perfect size but its zippers are faulty. Another might have the most durable materials but it feels too bulky. Don’t fret anymore! We did the hard work for you and reviewed our top five picks to help you find the best Crossfit gym bag for you. 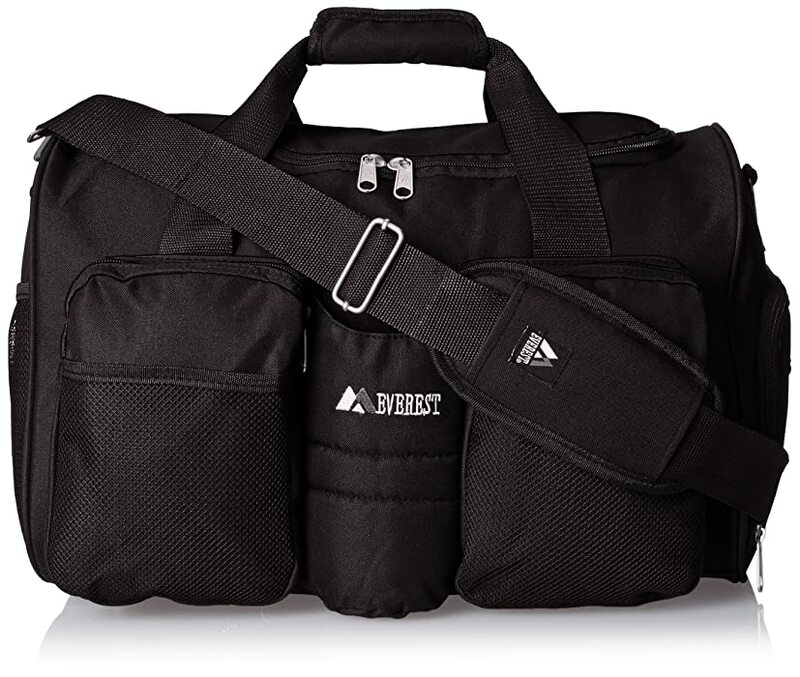 Everest Gym Bag with Wet Pocket This gym bag with wet pocket from Everest has a compact size yet it is also roomy enough to easily accommodate an entire Crossfit gear – clothes, shoes, water bottles, and other whatnots. It is also the most affordable one in this list, which makes this bag a strong competitor. 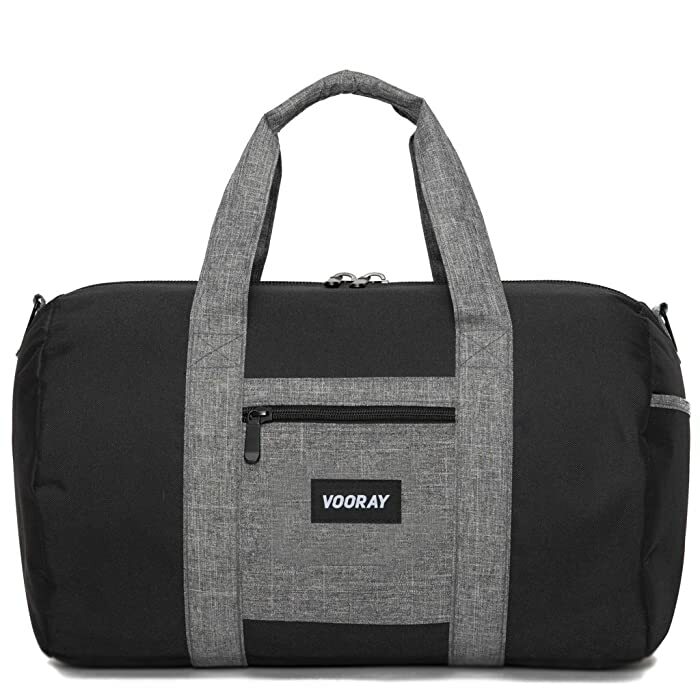 Vooray Roadie Duffel Bag If you’re looking for an easy to wash bag, the Vooray Roadie Duffel Bag is perfect for you. It uses a combination of polyester and nylon materials for a tough exterior and a sturdy yet convenient to clean interior. And if you’re bored with the usual black gym bag, Vooray offers a lot of designs and patterns to choose from. OGIO Crunch Duffel Bag The OGIO Crunch Duffel Bag lives up to its name. The round shape of the bag literally “crunches” your stuff inside so it becomes compressed and takes lesser space in the locker or even in the overhead compartment. If you’re not the type who packs light but you want to look like one, the OGIO Crunch Duffel Bag will definitely give you that vibe. 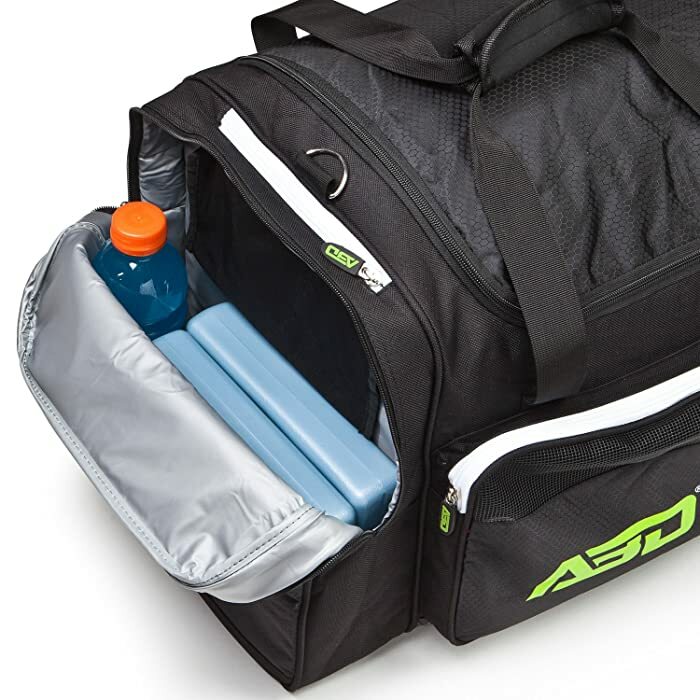 ABD Athlete Team Duffel Bag This gym bag feels like it was built for an entire team. No kidding. It has seven compartments and it even has a cooler compartment for your snacks and drinks. All the materials used are for heavy-duty purposes. This gym bag is a bit pricey but you get what you pay for. Under Armour Storm Undeniable II Backpack Under Armour is known for their high-quality and high-priced products, and their Undeniable II Backpack is no exception. In fact, their product is the most expensive in this list. But it does offer a lot of things that most gym bags don’t have – a dedicated laptop sleeve, HeatGear shoulder straps, water-resistant surface. And that’s just the icing on the cake. The Everest Gym Bag has a relatively smaller size than the others. It is only 11 inches high and 10 inches wide, which are still good dimensions for a Crossfit gym bag. You can put this bag inside a standard-sized locker with just a little maneuvering. This gym bag is made with 600D polyester. While this material is not really that thick, the good thing about it is it’s not heavy, as this bag only weighs about two pounds. This gives the Everest Gym Bag a lightweight feel but still durable enough to hold your things up to 70 pounds. It features a spacious main compartment designed with a wide zippered clamshell opening at the top so you can easily fit your own stuff. It also has two zippered pouches in the front and a side mesh pocket where you can slide your keys and IDs. Another very useful feature is the bag’s “wet pocket”. On the inside of the main compartment is a zip pocket with a mesh side. This opens into a bag where you can put your wet gear. The mesh on the side of this “wet pocket” exposes your wet clothes or shoes to air so it can dry. This bag also features an adjustable padded shoulder strap and Velcro close handles. However, the strap and its connectors are not as strong and well-constructed as the other materials. The strap is okay but its metal connectors are flimsy and have a tendency to break at the point where the strap and the hook meets. 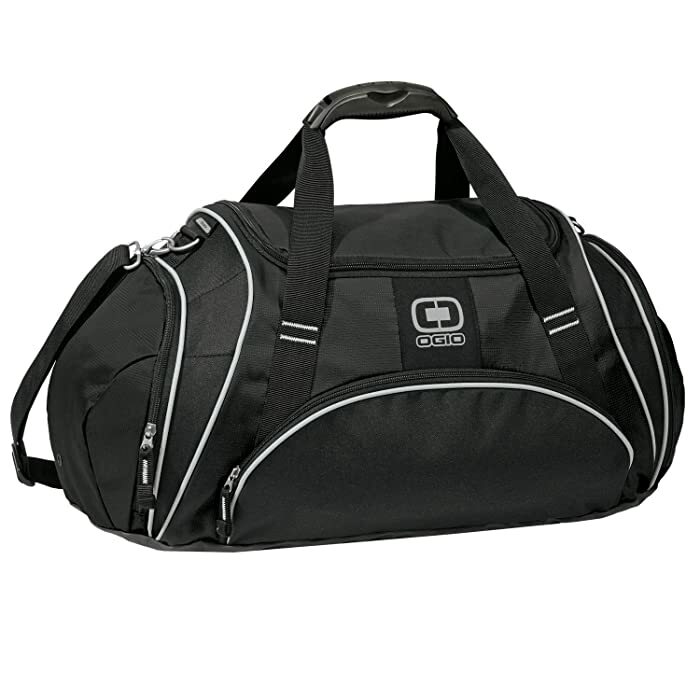 The Vooray Roadie Duffel Bag is also a compact-sized gym bag. It measures10 inches high and 10 inches wide, making it perfect for small lockers. It also uses 600D polyester for its exterior but the interior uses 100% nylon.The polyester protects the bag from everyday wear and tear while the nylonlining makes the bag very easy to clean. This combination of materials makes this bag very sturdy while stillmaintaining a light weight. In fact, the Vooray Roadie Duffel Bag weighs only1.4 pounds, making it the lightest gym bag in this list. It also features a sizeable main compartment, zip-enclosed pockets at thefront and on the inside, and an extra open side pocket. The zippers aremade for heavy-duty use and the bag’s handles are long enough for it to becarried like a handbag. If you prefer to carry it on your shoulders, the bagcomes with an adjustable shoulder strap with secure metal clips. Unlike other gym bag brands, Vooray offers several designs and colors.There are denim patterns, polka dots, and floral designs for those who wanta more eye-catching Crossfit gym bag. The only drawback with this bag is that it came with a strong chemical smell.It could be from the factory but we did have to wash the bag first to get ridof it. 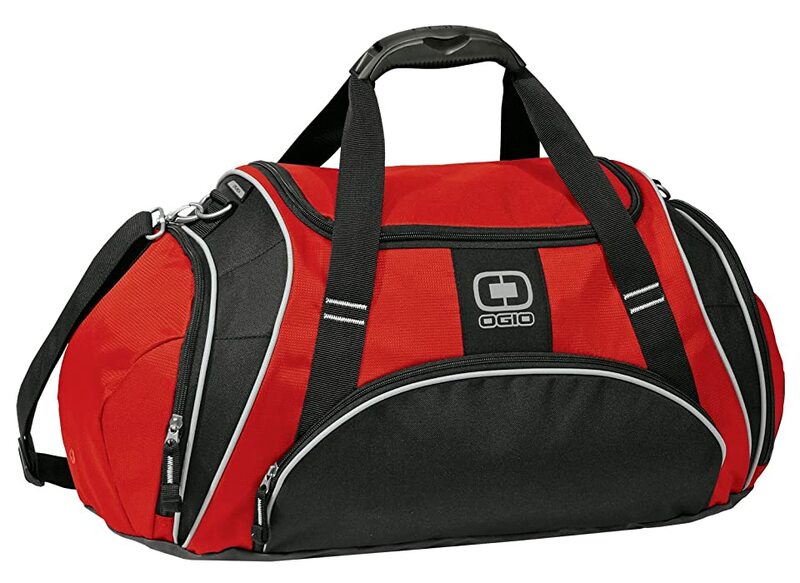 The OGIO Crunch Duffel Bag measures 13 inches wide and boasts of its U-shaped opening and oversized compartment. The U-opening is very convenient, as it allows you to easily stash your shoes and other bulky items. This bag also offers plenty of room for your things and your bag actually holds more than it looks because of the shape. Its round shape compresses your things inside so you won’t look like you carried your entire house in it. Plus, you will have no trouble putting it inside a locker because this duffel bag is also soft-sided, not like the typical rectangular gym bags. The OGIO Crunch also has a thicker fabric than the usual nylon gym bag but not as thick as canvas bags. Its fabric protects it well from moisture and sunlight but it does not do well against cuts and abrasions. This duffel bag also features a front zippered pocket for smaller items, a roomy wet pocket, and a special pocket equipped with a headphone port. The shoulder strap is padded, slip-resistant, and can be adjusted. It also comes with a clasp that prevents the strap from cutting into your shoulders. The zippers are also sturdy and the handle has a molded interlocks so you can fit the molded pieces together, which makes a secure and comfortable grip. However, the OGIO Crunch Duffel Bag could really use a water bottle holder. The ABD Athlete Team Duffel Bag belongs to the top tiers of gym bags. It is literally a giant. It measures 24 inches long, 13 inches wide, and 14 inches high. Its seven storage compartments could probably fit an entire team’s change of clothes. Aside from its incredibly large size, the ABD Duffel Bag still has a lot to offer. It is made with 1200D ballistic nylon shell, which makes it perfect for heavy-duty uses. It also has a weatherproof bottom and reinforced side walls. This bag is also the only one on this list that offers a cooler compartment for drinks and snacks. For those who are into backpacking and travelling, this duffel bag would be a great investment. However, the shoulder strap fasteners are not as sturdy as the zippers. The bag is also significantly heavier and bigger than the usual gym bags. If you don’t want to carry a bulky gym bag, then the ABD Duffel Bag is not for you. 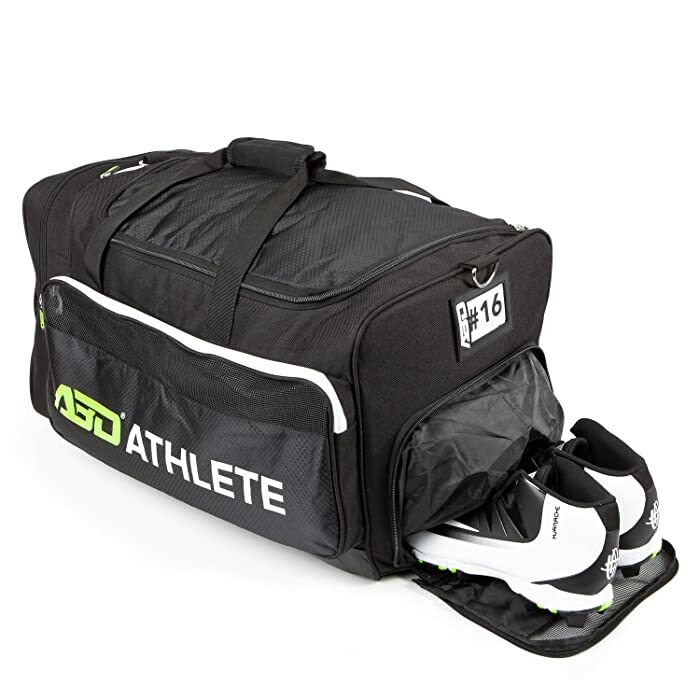 The ABD Athlete Team Duffel Bag also offers a one-year replacement warranty. On top of that, it also has a 90-day money back guarantee for those who change their minds. We highly doubt that will happen. 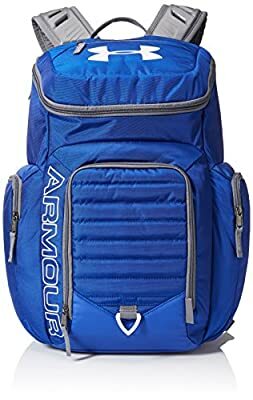 This backpack combines 100% polyester material with a patented Under Armour Storm technology for a highly water-resistant surface. It also has an abrasion-resistant bottom panel so you won’t have to worry about placing your backpack on the ground. If you’re the type who goes for wet and wild adventures, this backpack is perfect for you. The Under Armour Undeniable II Backpack showcases a very spacious main compartment with one interior slip pocket and four exterior pockets. You can also put your things inside with no trouble with its easy top loader access. There are no mesh pockets but there is a pocket in each side. Fortunately, both side pockets are deep and wide enough to carry a standard-sized water bottle but you will have to leave the pockets unzipped. This back pack could also be used for school and work. The interior has a soft lining to protect your files and electronics. It even has a laptop sleeve that can hold a 15 inch laptop. If you’re worried about shoulder and back pains caused by backpacks, Under Armour has got it covered for you. Undeniable II has adjustable shoulder straps equipped with a HeatGear feature for extra comfort. It also has front chest strap buckles to keep you snug. Plus, the back panel is padded with foam and built with an ergonomic design to help lessen the stress on your back. This should be the first thing that should come to your mind when looking for a gym bag. The size of your bag should correspond with its intended purpose. Similar with size, your choice of materials and construction will depend on how much stuff you will carry and how often you will use your bag. Look for a bag with materials durable enough to hold all your things and assembled strong enough to last for a long time. How much stuff will you put in your bag? Do you want to keep it in separate compartments? Choose a bag with compartments that you know you will use. Remember to also check for these things. If any of the strap or clips break, you will be lugging a heavy bag around. All the bags reviewed here are worthy to be considered for the title of the best Crossfit gym bag. However, our most favorite pick would be the OGIO Crunch Duffel Bag. Why? It’s not too small or too big, it has enough space and number of compartments for a complete Crossfit gear, and it uses sturdy materials and meticulous construction. Our favorite feature would also be its “crunch”. We all know how limited the space in our lockers can be and this feature is really useful. Plus, it’s also not too cheap and not too expensive. The OGIO Crunch Duffel Bag is just right.